The European Central Bank has published previously secret correspondence in which it pressed the Irish government to seek a financial bailout. 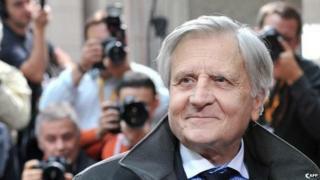 The Bank's former President Jean-Claude Trichet wrote to the Irish Finance Minister in November 2010. He threatened to cut off emergency funding to the country's banks. Mr Trichet said the support could only continue if the Irish government made a written commitment that it would seek financial support. The letter to the Finance Minister Brian Lenihan, who has since died, said there should be a commitment to "fiscal consolidation" which means austerity, or cuts in public spending and tax increases to reduce the government's borrowing needs. Ireland applied for financial help two days later and has received loans from the European Union, the International Monetary Fund and some individual countries, including Britain. The total foreign assistance agreed was €67.5bn (£52.8bn), though in the event it was not all paid out. The terms of the bailout have been controversial in Ireland. The spending cuts and bank rescues are resented by many, and the programme had a rough ride in the Irish parliament, although it was approved. Inevitably, evidence of ECB pressure has inflamed the controversy. Shane Ross, an Independent member of the Irish Parliament told the broadcaster RTE that "Ireland was humiliated, bullied, picked on first and treated very badly". Michael McGrath, finance spokesman for Fianna Fail, which is now in opposition but was in power when the bailout was agreed, said the ECB had exceeded its remit and had "strayed into areas of policy which should have been reserved for the democratically elected Government". The ECB says the Irish decision to apply for a bailout reflected the "sheer scale of the domestic crisis and aggravating external factors". The ECB's concern was about loans, known as Emergency Liquidity Assistance provided by the Irish Central Bank, with the ECB's consent, to the country's commercial banks. It is supposed to be available only to banks that are solvent, but having difficulty raising funds to keep running. The banks are also supposed to provide collateral - assets that in effect provide a sort of insurance if they can't repay. Mr Trichet's letter suggests that their view was that the banks would only be solvent if they had new capital provided by the government. In another letter, sent a few days earlier, Mr Trichet also pointed out that much of the collateral was debt issued by, or guaranteed by, the Irish government. The implication is that without financial assistance, the Irish government's creditworthiness was questionable and so, therefore, was the value of the assets used as collateral. The economic consequences of pulling the plug on the emergency financing would have been serious. Without it, the Irish financial system would have gone into a severe crisis. It is not the only occasion the ECB has threatened to withdraw support from a country's banks unless there was a European bailout. The ECB did it in the case of Cyprus, and for much the same reasons as with Ireland. With Cyprus though, it was not so much secret letters to the Finance Minister as a publicly available press release.